So How Good Was My Crystal Ball? Looking forward to tomorrow’s ‘welp, I was wrong’ tweet. This is just flat wrong. Democrats never asked for any particular kind of wall, and anyway, a steel bollard fence is what we’re using right now for the hundreds of miles of border barriers already constructed. It’s what the security professionals have wanted from the very start. Illegal drugs are almost all smuggled in through legal ports of entry, not hauled across the desert. Building a wall would be unlikely to have any substantial affect on drug smuggling. 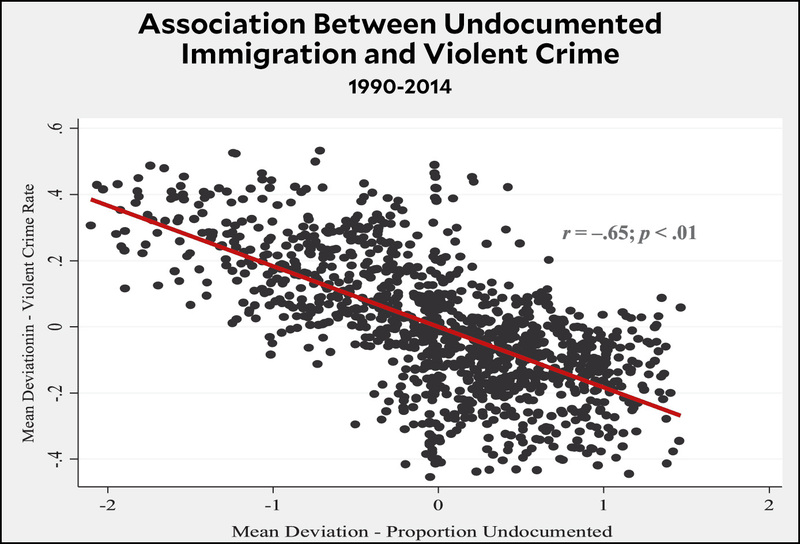 As the chart shows, violent crime decreased in areas that experienced more illegal immigration, and there are plenty of other studies that show similar results. In contrast, there are very few that provide any evidence of the opposite. In general, areas with large proportions of undocumented immigrants tend to be fairly peaceful, filled with people who just want jobs and are eager to avoid doing anything that might bring them to the attention of the police and get them deported. More here. This falls into Wolfgang Pauli’s famous category of being so ridiculous that “it’s not even wrong.” It’s like saying the wall will be funded indirectly from the taxes paid by the workers who build the wall. That’s not how it works. According to Daniel Dale of the Toronto Star, child trafficking across the border is pretty rare, and he seems to be right. Even the official statistics are fairly modest, and they’re almost certainly overstated anyway. Many of the children taken away from the adults who accompany them turn out to be related after all, or are being looked after by a friend. Actual cases of child trafficking seem to be very uncommon. 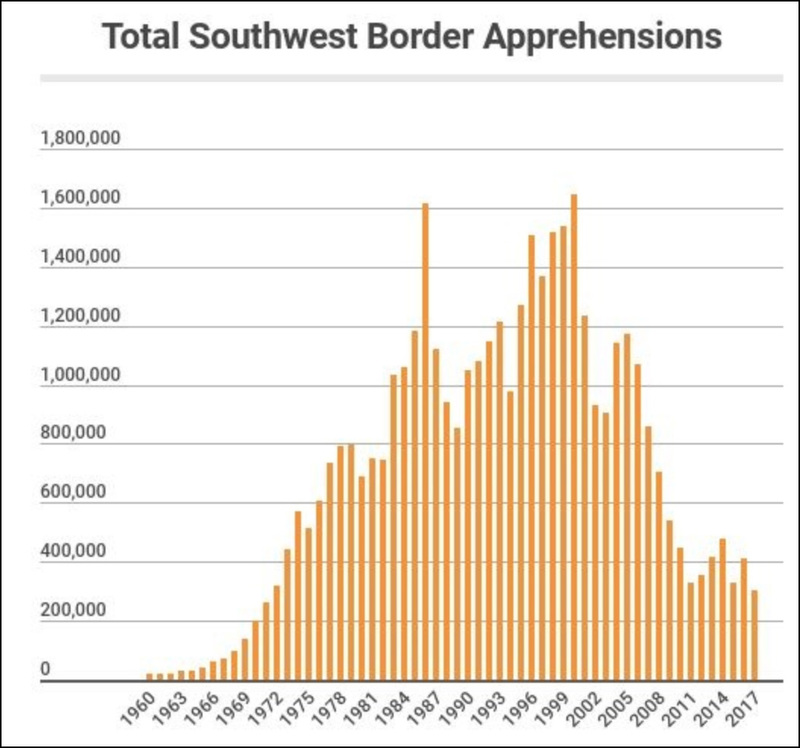 There’s just no way to spin this into a security crisis, especially since 700 miles of fencing has been built since 2000; the Border Patrol’s budget has expanded considerably; and the number of agents patrolling the border has doubled—with another 5,000 on tap for future expansion. This is highly questionable, and the bulk of the evidence suggests that illegal immigration is a net wash in terms of wages. However, there is some evidence that it affects the wages of the lowest income workers and of workers who don’t speak English well. So…. This is untrue. Democrats have acknowledged everything except the need for a wall. The one and only reason for the government shutdown is Donald Trump’s obsession with spending billions of dollars on a wall that would have little to no effect on border security. So what’s the bottom line? I’ll give Trump half credit for #3 (crime) and #7 (wages), since the evidence on both isn’t 100 percent clear. So that gives us a score of six lies and two half-lies in the space of eight minutes. Even grading on a curve, that’s a lot of lies. So I was wrong and the Twitter mob was right. Even with every possible incentive to be as truthful as possible in front of a national audience—not to mention an army of fact checkers just waiting for every misstep—Trump told a lie about once a minute. Apparently the man just can’t help himself.